Eachine racer 250 review - affordable Ready to fly racing drone. The growing trend among drone enthusiasts in 2016 has been, until now, drone racing. The potential in commercial UAV’s is no longer limited to photography, videography and recreational activities. Drone technology has been developing at an impressive rate and consequently new types of powerful aerial machinery are coming to our hands for the first time. At first drone racing may sound as an expensive hobby, but I’m happy to report you it no longer is a Sci-Fi dream. Robotic and RC companies all over the globe have been investing in astonishing and yet affordable racing drones. The battle for top racing drone manufacturer has begun and we drone enthusiasts are the ones benefiting from it. Every month new drone technology breakthroughs are achieved, drone manufacturers compete against one another for both price, quality and ease of use. Something which has resulted in a wide variety of great racing products already available in the market. As always we at Drones Globe aim to always bring the best to our readers. With so many great companies investing in the ‘ready-to-boom’ drone racing market, Eachine wouldn’t want to miss on the action. Therefore, it has already amazing racing products which will surely rival brands such as Vortex and Walkera. Today we’re here for Eachine Racer 250 review, a fully built FPV racer for an amazing affordable price, definitely one of the best and low-cost choices for any beginner. If you are looking for a First Person View drone racer Ready to Fly out of the box for a very affordable price. Then hello Racer 250!! 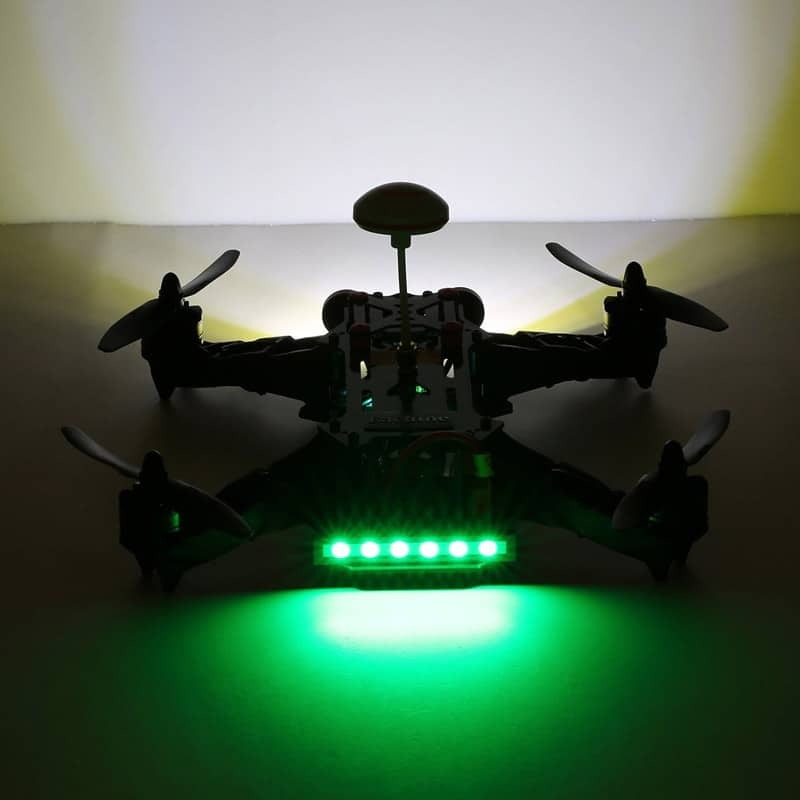 This amazing little quadcopter is built with carbon fiber material, very lightweight (400g without battery) and extremely durable to practically any crash. Frame is 22 x 23.3 x 5 cm and wing length is 14 cm. With Racer 250 no beginner drone racing pilot should be afraid of the common first hits and crashes all beginners have to face. Due to its super anti-fall structure and carbon fiber frame Racer 250 is the ideal affordable drone. This drone is an unstoppable racer. Ultrafast flight speed thanks to its 2204 2300KV Brushless motors, Simonk 12A Brushless Electronic Speed Control (ESC) and CC3D flight controller. 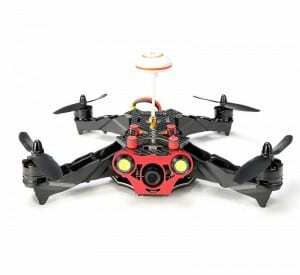 All this also allow ERacer 250 to be a responsive and easy to control quadcopter. Racer 250 uses a 600mw 5.8GHz frequency remote with 6 channels, this is optional you may choose to use another RC remote. The included (optional) remote may also come with a 7” 5.8GHz FPV monitor with 32 channels and built-in On-Screen (OSD) data such as current speed, flight time, battery voltage, working channel, etc. All of which are essential for any FPV (First Person View) racer, live flight data is crucial for you to understand what’s happening with your drone. Indeed a well built, reliable UAV racer which will swiftly amaze many at the racing tracks. Racer 250 fun doesn’t stop here. What is the next essential piece of hardware for any FPV racer enthusiast? Of course it’s the FPV camera. Without there would be no real-time video and consequently no racing. Due to how fast and manoeuvrable racing drones are if you don’t use a FPV camera you will lose track of your drone in a matter of seconds. Fortunately ERacer 250 truly comes in a complete package, providing its own First person View camera. A 1000TVL camera with adjustable angle and that supports HD night flights. Great quality, you will be very pleases with how it performs. Of course real-time video transmission wouldn’t be possible without a mushroom antenna, therefore Eachine includes its own mushroom antenna that transmits live video in 5.8 GHz frequency directly to your 7 inch monitor. If you are serious about drone racing and a FPV monitor just doesn’t fit your needs, don’t worry. Eachine has produced their own FPV goggles, the Eachine VR-007 Headset will enhance your FPV racing experience, opening up the game to an all new level. This headset does not come included in the package but you can easily purchase it separately. If you are wondering what powers all of this amazing features and specifications, well, it’s a powerful 11.1V 1500mAh 25C 3S lipo battery (included in the package) which provides Racer 250 up to 14 minutes of flight time. This is the average time a racing drone within this price range usually gets from its battery. Keep in mind you as a pilot are able to modify your racing drone and use other hardware including battery to increase your flight time. Besides the good quality with no delay real-time video transmission and built-in OSD data features, Eachine Racer 250 also has another useful feature: Snowflake Screen. A screen effect that is much more useful than the typical blue/black screen. Let me explain, instead of losing the full connection when transmission signal is weak, the FPV screen will do whatever it can to keep the connection working, lowering the image quality to reinforce connection. The pilot will have as much visibility as possible even when the connection is low. Racer 250 uses the widely popular flight board CC3D which pilot can configure through a software (included) called Open Pilot GCS (compatible with PC, Mac and Linux). CC3D features STM32 32-bit microcontroller running at 90MIPs with 128KB Flash and 20KB RAM, 3-axis high-performance MEMs gyros and 3-axis high-performance MEMs accelerometer, Tiny 36mmx36mm 4 layer PCB for superior electrical noise reduction and flight performance, Innovative Flexi-port technology for superior port flexibility and Mbits on-board EEPROM for configuration storage. CC3D will truly enhance your drone racing experience and take your skills to the next level. 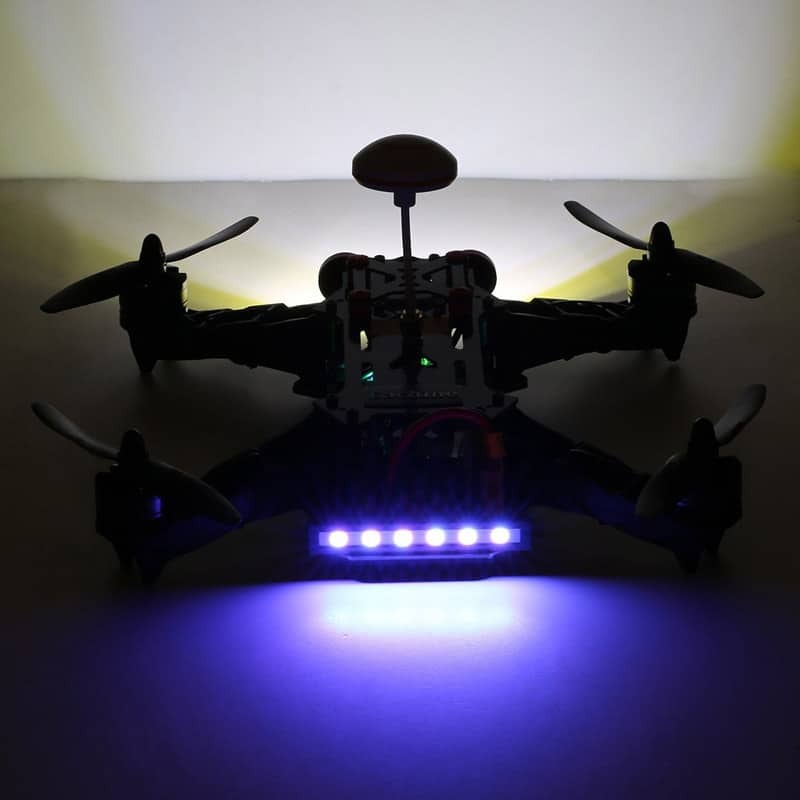 Are you curious about drone racing? Have you already tried it? Are you an avid drone racer? 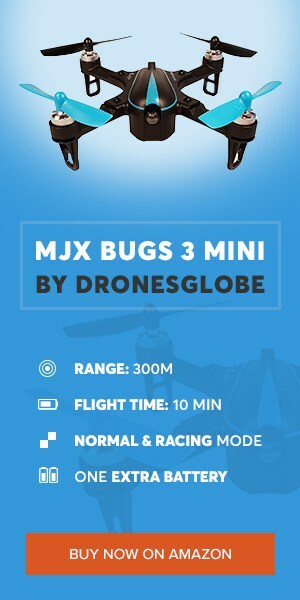 Let us know your opinion about this drone, do you own one? Are you considering buying one? We at Drones Globe always look forward to know your opinion, so please let us know on the comment section below. 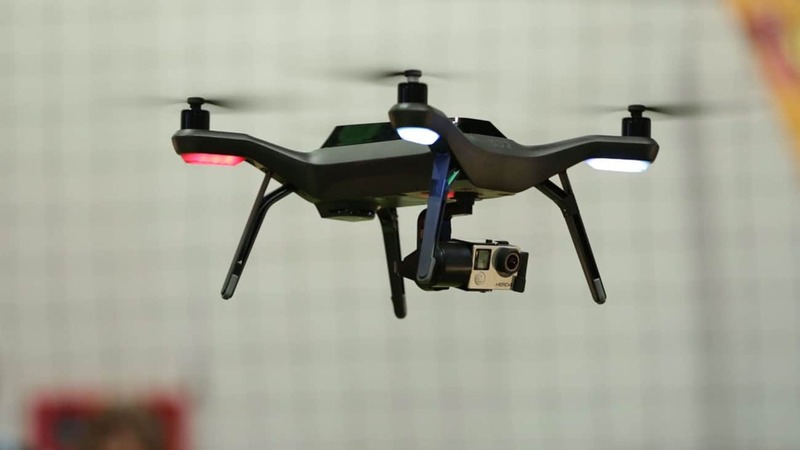 If you would like to read more about racing drones check our Walkera furious 320, Walkera runner 250 review and check our Top 10 Drones articles for more amazing and affordable drones! Have a good day and race for the number one place with your new drone! Eachine 250 looks ok，but I know another racing drone Akaso F250a ，maybe Akaso F250a is more professional.